The Dyson AM01, or also commonly known as the Dyson Air Multiplier One Table Fan is one of the very first models in a series of 'blade-less' fans that is revolutionising the domestic cooling market. Dyson as a brand are well known for their mastery over air-manipulating technologies and the Air Multiplier range is a fantastic example of this mastery in action. Other brands are starting to pick up this technology under their own names but if you want to go straight to the source then Dyson is the brand you should be looking at. 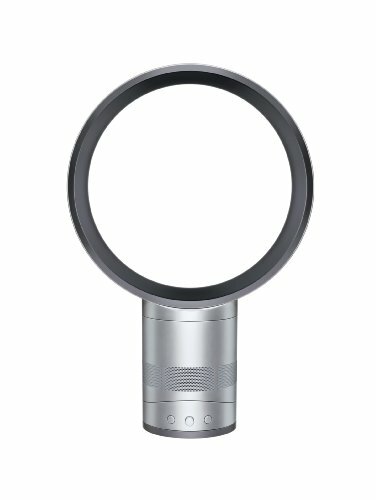 In this article we take a look at one of the smaller Air Multiplier fans with a review and a look at a summary of customer opinions on the Dyson (Table Fan) AM01. The Dyson AM01's design and look is easily its most striking feature. It looks like a piece of science fiction technology and the way it fans air towards you is somewhat mystical with it having no visible moving parts. In terms or appearance it's very much a 'love it' or 'hate it' look, this being said it cannot be denied however -- that it certainly makes a good conversation piece. If you are very much into the latest gadgets and hence have a lot of other modern appliances then the AM01 will look right at home. In terms of practicality -- the AM01 also features an interesting pivot feature, which lets you tilt it on it's own center of gravity. This way you can easily tilt the fan up or down to suit your specific needs without any worries that it will topple over. Through having the top section free of blades or a heavy motor means all the weight is in the base making for a very stable device. The motor on the AM01 is rather audible but overall the fan is quieter than your traditional fan. This is because the sound of blowing and buffeting air and moving blades is no longer there. However, this has the unusual drawback of making the motor noise more noticeable, which may understandably bother some customers. The Dyson AM01 is not the most powerful fan you can buy in it's size, the awards for volume of air moved would probably go to other high powered, bladed fans. However, this series of fan has one very distinct advantage in the way it moves air - it does it without buffeting i.e it is gentle and smooth. If you have ever sat in front of a traditional fan for an extended period of time you would be pretty familiar with the unpleasant effects they can have on your eyes. This is caused by the choppy waves of air created by fan blades. However, the AM01 instead has a perfectly constant stream of air that cools without this choppiness. Overall it is a much more pleasant experience over longer periods of time. In this sense, it is perfect in an office desk based scenario or a study allowing you to concentrate on your reading or work -- whilst remaining cool from a fan without having chopping waves causing distress upon your eyes. Most bladed fans feature some sort of cover or cage to prevent small fingers from being injured by fast spinning fan blades. However, these cages can't stop hair or loose clothing from being caught in the blades and serious injuries can occur when this happens (especially around small children etc.). Because the AM01 lacks any form of exposed moving parts a cover is not necessary and there is very little chance of any other injury occurring. The Air Multiplier series of fans is easily the safest fans that money can buy. The AM01 features a pretty simple set of controls - just and on/off button and a dimmer switch, which adjusts the volume of airflow. Moreover, as the AM01 has no cover or blades means that the AM01 is pretty simple to clean as well. All that is required is that you simply unplug it and clean it with a slightly damp cloth to remove any dust, give it a quicky dry -- and you're done! Dyson are in many ways the Apple of their product categories. Smooth lines and sleek designs that are well engineered and manufactured. However, Dyson are also a fan of soft plastics in some of their products and these can be subject to scratching in the manufacturing process or during shipping. Most retailers and Dyson themselves have a good history or replacing any damaged products though, so this is rarely a serious issue. The Dyson AM01 comes with a 2-year warranty and you will also find that many retailers will also provide additional warranties on top of this -- extending up to 3 years or more. Although a review of technical specifications can be helpful you can only truly gauge the long-term quality and performance of a product like the AM01 through reviews from customers who have actually purchased the fan for personal use. Thankfully, the AM01 holds up very well to the ultimate customer test with reviews stating things like "Exceptional machine, beautifully built, (and) exceptional operating parameters." One customer purchased the AM01 for use as a nightstand fan and they were extremely pleased with the smooth airflow and fine adjustability offered by the dimmer controls. They also said that they found it to have a "very quiet and soothing white noise" and a "smooth breeze-like output". If you check out the Dyson Home Website you will find that the AM01 retails at approximately the $300 mark depending on which size you opt for either the 10 inch or the slightly more expensive 12 inch ($330 mark) AM01 table air-multiplier, however if you were to do a bit of online bargain hunting you are likely to find that you can get hold of one -- for a fair bit cheaper. For example, if you check out Amazon.com, you can get a brand new AM01 for $279.99 and a used one (in 'Like New' condition) for less than half the price at $135.00 (as of 29/10/2012), but ultimately -- it is certainly worth checking out. Overall, the AM01 is a unique and advanced fan. It's offers a higher airflow quality and quieter operation than that of traditional fans but without as much power as some alternatives. If you want a safe, interesting looking unit with smooth air flow for use in a smaller room then the AM01 is an excellent choice for you. If, however, you need a more air output for a larger room and noise isn't really a concern then a larger Dyson model or a traditional bladed fan may be more appropriate for your needs.